We celebrated, we laughed and we had fun presenting a musical look at the joys and tribulations of the Christmas season. Our audience roared; they clapped; they joined in to sing some old favourites. Sandee Blackburn and Nancy St Michel were two friends visiting over coffee. Sandee was the voice of joy and optimism while poor Nancy was having trouble finding the spirit of Christmas. Witness her paltry Christmas gifts - blank gift cards - so the recipients could fill them as they saw fit. Plus she really, really hates fruitcake. Finally, after witnessing her friend leaping to the aid of an older lady, listening to multiple carols sung by Alberta Heartland Chorus, River Hills Chorus and guest quartets, seeing the joy in a small girl's face, she came around. In the end she was going home to bake fruitcake. Our mission was complete. But there was more...a visit by Santa Grinch, (Marguerite Denman) who tried to make off with all the gifts and even a stroller with a BABY in it. Christmas was hard to find, but with the help of our friends, we will be celebrating for one more year. He was soon driven off by the realization that Christmas is about more than presents and lights. We owe special thanks to our volunteer stage director, April Brunelle and the house director, Lynell Bird. They made the day seamless and stress free. Thanks also to the quartets: Chance!, Leap of Faith, and Mosiac Blend. Our guests, River Hills Chorus were a great success and when both choruses sang together, they made the rafters ring. A definite favourite was the soloist, ten year old, Elizabeth Bird. She bravely opened the show, and later sang along with the chorus, complete with the choreography. 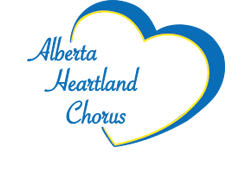 Thanks to all who came out to support Alberta Heartland Chorus. We can hardly wait to entertain you again. Check out the gallery for pictures.